When we talked about the best cheap electric skateboards we pointed out that the bottom of the barrel of the entry-level market segment feels like looking for a needle in a haystack. The chances of finding something good are extremely slim. But, if you manage to find a good catch the price/value ratio will blast you. The next step on the price ladder presents a completely different story, though. With more room to play with and without pressure to make compromises in virtually all engineering departments, the manufacturers are capable of pushing more versatile products that sometimes even include a couple of premium features. So, let’s delve deeper in this pool of creativity and take a look at some of the best electric skateboards under $300. AC Electric Skateboard is a very interesting beast. The price gap between this and the previous units is really not that big – only a couple of dozens of dollars. The performance, on the other hand, is leaps and bounds ahead of the pack. A true testament to frugal engineering. But, let’s go one step at the time. The heart, and at the same time one of the best standout features of AC Electric Skateboard is its deck – a beautiful piece of craftsmanship made out of six layers of maple wood sandwiched between two layers of bamboo. An excellent combination that provides optimal durability that never comes at the expense of the weight. The deck is combined with the grip tape and the set of wheels that, unfortunately, don't feel so premium but do the job nevertheless - definitely an upper tier. Take a peek below the deck and you'll find a very powerful 350W brushless motor that produces very high speed (for this type of the board), and, even more important, allows you to mount some pretty substantial weights on top of it. All this amounts to rock-solid performance and smooth riding experience that can easily be mistaken for some unit with much more handsome price tag. The skateboard speeds from zero to its top speed in a matter of seconds and you never feel out of control or out of balance. The same can be said about steering and braking. Unfortunately, no product on this world is without flaws and AC Electric Skateboard is no different. Its battery life is pretty poor. Nowhere near as bad as some of the other entries on this list, but still very underwhelming. Still, look at it from the bright sight – at least you’ll get a powerful motor to play with while the battery’s running. AC Electric Skateboard is a skateboard that more or less manages to check all the affordable specs requirement. The weight may be slightly higher (manageable 7kg), and the range is stuck at 16km. Not bad, but compared to the other highlights, these numbers fall in comparison. On the other hand, the speed of 27km/h and the max load of amazing 136kg definitely sound much more pleasing. A well-balanced package that knows what to omit and where to excel. Unfortunately, the features AC Electronic Skateboard puts on the table are far from impressive (too bad, we could’ve got a killer package). You get to choose between the three-speed settings (low, middle, and high), holding down the brake button will offer a nice take off assistance as you go, and brushless motor works pleasantly quiet. With its solid building blocks and lucrative price BLITZART Huracane 38" Electric Skateboard, qualifies for the top segment in the dirt-cheap electric skateboard market segment. Don’t take this as an insult, though - its specs and overall performance lend this unit enough power to compete with more expensive contenders. It is also mentioning that BLITZART Huracane is quite a looker. If you’d ever wanted to leave an impression while roaming the street, the skateboard’s sleek, black body will certainly catch a couple of curious looks. 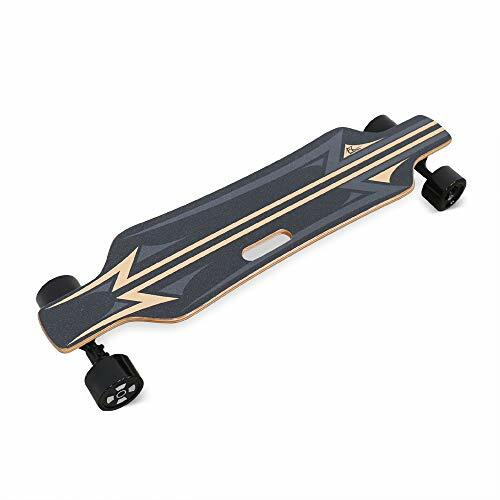 Speaking of looks, the Tornado version is an identical product, but with a rounded board, while Huracane sports that standard longboard look. There are three versions available, all black but the wheels color change - black, light orange, or neon green. Looking at the specs, it’s not very hard to conclude that Voyager Neutrino was designed as a compact unit aimed at casual users. It weighs around 13 pounds and breezes with pretty stunning 17mph (of course keeping in mind the unit’s price). The load the skateboard can carry is pretty solid as well. You can mount up to 250lbs of load and still be able to run at a reasonable speed. However, we have to talk about the elephant in the room – Neutrino can traverse only 10 miles before running dry. ​As you would expect from the unit costing this much, the special features are pretty scarce. The included wireless controller offers basic functions - forward/brake, shift which will allow you to go reverse. Furthermore, there’s a light indicator of the battery life, and a On/Off button below near the charging port. You do get to choose between two speed settings (beginner, expert). However, putting Hiboy S11 amongst the dirt cheap bunch for children would do the product a huge disservice. With its solid core specs and stable overall performance, this neat entry feels much more at home on this list. Even more so, when we take into account that some of the other contenders are seriously underperforming in important departments. An energetic and youthful, if a bit divisive design (the skateboard was made to appeal to kids, get over the neon details), dual hub motors capable of pushing heavier weights and climbing smaller inclines, solid speed, stable performance, rock-solid build quality and even a couple of interesting features that spice this package up way beyond its selling price. Of course, there are some drawbacks – you don’t get any indication when charging the battery and the remote is… Well, let’s call it underwhelming. But still… The things Hiboy S11 does well coupled with very appealing price make us more than willing to overlook some of its flaws. Just remember we are talking about an entry-level unit. Much like the rest of the skateboards that are aimed at children Hiboy S11 is not particularly fast. However, the speed of 20km/h is not that bad, either – just on par with some of the lower-ranked entries on the list. The range and the weight fall in the same basket, they score 10km and 4kg respectively (the latter number is actually pretty good). The unit is also capable of climbing the 8% inclines which is not much, but hey, at least you get to go uphill. When it comes to the features, Hiboy offers a couple of pretty neat surprises. First, you get a regenerative braking system – a true rarity in this price range. Second, there’s the UL 2271 (safety standard for batteries used in electric vehicles). Finally, unlike most of the products in the entry-level segment, Hiboy S11 actually allows you to choose between four different speed settings which translates to better control over the board. Maxfind Electric Skateboard is a product that shares a similar set of pros and cons as the Voyager Neutrino. As a matter of fact, on first glance, they look similar to a fault. You get the same black body, same streamlined design and the similarly limited range – a result of the slim battery built into the deck. You even get the raised tail – a welcome upgrade that should make manual breaking far easier. So, why would you choose this product over the other? Well, to put it simply, all of the core specs are improved. The improvements may be incremental, but at least they are present. The range may still be subpar, but the charging times are much better. Also, the deck is made out of 9-layered maple which manages to strike the almost perfect balance between weight, durability, and stiffness. The motor is also reasonably powerful allowing you to climb the grades up to 15 degrees. The design of the deck may look somewhat cheap, but it’s really a matter of personal taste. the good news is that the top of the deck features a tactile overlay that keeps the rider's feet firmly on the ground. However, there is one major drawback. So big, that it easily drags down the skateboard below the competition. The weight capacity is only 60kg. This simple fact renders the unit virtually useless for the vast majority of customers. Even the way cheaper models that sell under $200 pack more power than this. So, in spite of all the small touches that Maxfind did right, in the end, we are left with the overpriced model that can be used only by children. Although lacking in places, Voyager Neutrino makes a better-rounded package. Putting aside the poor weight capacity of only 60kg, Maxfind Electric Skateboard scores some pretty decent specs. The deck length of 68.5cm allows solid stability and the hub motor works like charm. No twitching, no hiccups. The top speed of 24km/h definitely goes above the average (at least for this price category) and the weight of only 3.7kg makes carrying around very easy (of course, we could live with a heavier board that features a more powerful motor). Finally, we have a range of 13km – nothing to write home about, but not the worst score on the list either. The charging times are more than fast (the battery goes from 0 to 100% in one hour) so you could, theoretically use the board for commuting if you are going to make short stops along the way. Once again, the manufacturer has decided to cut down the price of the product by equipping the package with bare essentials. In this case, that would be a decent Wii Nunchuk-like remote that allows you to choose between two essential speed settings. Action Blink Lite is a product that tries too hard and somehow fails in the most important areas. It tries too hard to look youthful and edgy and ends up looking ridiculous instead. It tries too hard to find some kind of gimmick that will help it find a place in the crowded market and ends up putting the spotlight on the weight. Ok, 3.5kg are indeed pretty impressive, but does anybody really care about this feature when much better units are only 200-500 grams heavier. The difference is barely noticeable. And still, the unit has enough audacity to sell at the highest price on the list. Don’t get us wrong, the Action Blink Lite doesn’t only fail in comparison to the other products we covered on the list, but fails even in its own right. The speed is far from great, the supported weight firmly below the average, and the range is horrible. The frustrating fact is that most of these problems could be remedied if the manufacturer hadn't made the decision to pursue the title of the lightest electric skateboard on the market and equipped the unit with more powerful battery and stronger motor. Of course, not everything is all that bad. The skateboard handles reasonably well (once you manage to finally sync the board with the remote) and acceleration feels surprisingly smooth. Build quality is not that bad either. Still, all these positives don’t change the fact that Action Blink Lite is rotten from the inside. What we’re left with at the end is the overly expensive skateboard that can be used only for neighborhood stunts and short rides across the campus. Of course, only if you don’t have more than 60kg. So, yeah, we have the weight limit of 60kg – the same limitation we can see on Maxfind Electric Skateboard. However, Maxfind’s product performs much better in other departments. Action Blink Lite, does nothing substantial to warrant its price. For instance, you’ll be able to pass only 8 kilometers at the speed of 16km/h in one charge. But, for what it’s worth, the unit is very light and ergonomic, so once the battery’s gone, you won’t have to carry too much dead weight. When it comes to the features, it’s good to hear that Action Blink Lite bodes slightly better. This time you get the regenerative braking (a weird card to play given the specs, though), an option to use Android or iOS app for navigation and very forgiving 45 minutes of charge time. Since the models that feature a price that approximates $300 offer much more variety than their cheaper siblings, the list of considerations you have to make while buying goes beyond the basic quality-driven decisions that are crucial for cheaper models. Let’s take a look at some of the things that should pop up on your radar if you want to make the most for your 300 bucks. Obviously, we are still very far from the point where the price we are asked to pay would grant the quality of the board. So, keep the quality of the deck and the wheels as your top priority if you don’t want to put your skating dreams to rest after a couple of crashes. A solid $300 electric skateboard usually features a maple deck, and polyurethane wheels so there’s no reason to go below this golden standard. Well, unless you are pursuing a lighter unit in which case you can get away with carbon decks that still offer a very reasonable sturdiness. As for the warranty, 6 months to test out the performance and discover potential workmanship flaws should be more than enough to ensure you peace of mind. Just make sure to read the fine print and check what's covered. In the broadest of terms, the battery capacity has the biggest impact on how far your off-road electric skateboard will be able to roam in one charge. But, only in the broadest in terms. If we take a look at the bigger picture we can see that the board’s range is drastically impacted by the motor’s power and type, as well as the unit’s power management. That is why, when you inspect the number of ampere-hours the battery packs, take a look at how these numbers translate to much more tangible and easy to grasp kilometers of range. Hub motors – A cheaper of the two predominant varieties, hub motors are very light, compact and they are built directly into the wheels. They are also very light and have a fewer number of moving parts which makes them less prone to mechanical damage. The major downside, since they’re built into the wheels their torque is not all that great. Belt motors – A true rarity in this price range (which doesn't mean they cannot be found) belt drives are more powerful and produce great torque which means they can easily accelerate or climb up the hills. More torque also implies better power management. However, belt drives are also much louder and harder to maintain. When it comes to power, this price range offers a lot of versatility. You can expect the units that go all the way up to 400W which is pretty solid. A skateboard deck has a lot more going on, even if we completely take the material out of the equation. Since we are going out of the beginner’s league, let’s breeze through some of the deck features that should provide you with the optimal, personalized performance. Stiffness – A flexible deck is capable of absorbing some of the riding induced shock. A stiffer deck will produce a bumpier ride but allows for better control over the wheels. An ideal option sits right in the middle. Length – The longer the deck, the more stable the board is. However, the bigger dimensions also entail heavier weight and bigger power draw. Wheelbase – Wheelbase is the distance between a pair of wheels. The longer wheelbase provides better stability at high speeds. These would be all the small details that have an influence on the board’s overall performance but not to the same degree as the core features. Remote – One of the most popular ways manufacturers use to cut the costs. No wonder the remotes in this category are usually trash. Still, good response time, LED screen and solid grip can drastically improve the things. Grip tape – A deck overlay that keeps the rider’s feet tightly on the board. An addition always nice to have. Carrying handles – Some of the boards have a pair of carrying handles built into the deck. They are incredibly convenient when the batteries run dry. Are below $300 skateboards good for first-timers? Well, if you need to sharpen your skating teeth, choosing a more affordable unit definitely makes more sense than pulling out a big grand out of blue. Even more so if you take into consideration that some of the cheaper electric skateboards feature rock-solid and very forgiving specs. However, if you've never set your foot on the skateboard before, talking a couple of rides with the classic unit should be a much better testing ground. We would recommend you get a go-pro, or a drone that can follow you around! Check out our sister site, Buy Best Quadcopter for some decent options. Can I use my electric skateboard when the battery runs dry? Yes. Even the skateboards that are powered by belt drives can be used if the battery’s dead. You’ll just need to put more effort into it. Be aware though, that electric skateboards pack dozens of electronic components that can explode when damaged, so save the stunts for your regular board. Do electric skateboard last longer than regular skateboards? It really depends on how well you take care of them. Electric skateboards that are frequently crashed or exposed to rain, don’t have too big of a life expectancy. On the other hand, normal skateboards that feature only mechanical parts don’t have this problem, so it’s safe to say they have a bit sunnier future. Still, it all boils down to maintenance. Yes, but you need to abide by certain limitations. In most of the areas, the speed limit for electric skateboards is 32km/h (20mph). How do the speed setting on electric skateboards work? Slow – Limited speed and only 20% of battery available. Great for beginners. Eco – Even stronger speed limitations, but 40% of the battery on disposal. Good for long rides. Fast – Full speed and 60% of battery. GT – All bets are off. You get full power and full battery capacity to play with. We hope you enjoyed this roundup of most popular electric skateboards that currently sell under $300. What do you think about our choices? Let us know and share the post with your friends on Facebook.